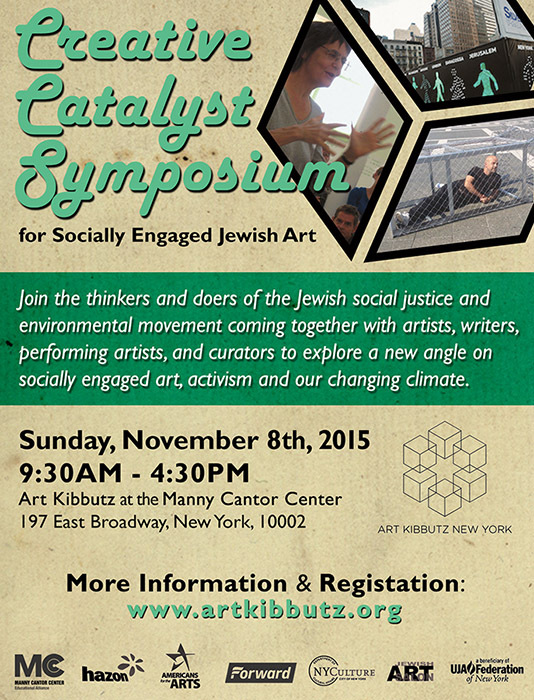 Creative Catalyst is a 1-day conference and platform to support socially engaged Jewish art that highlights the work of artists, curators, activists, community leaders, and organizations. The event’s goal is to create dialogue around socially engaged Jewish art, the structures and networks of support for artists working within social issues. For more information & registration click here. Art Kibbutz, co-sponsored by the Jewish Art Salon, Hazon, The Manny Cantor Center, The Jewish Daily Forward, UJA Federation of New York, and Americans for the Arts, is initiating an exchange between artists and community activists to further tikkun olam. Artists and creatives have untapped potential to help facilitate social change in America and worldwide. Today, more than ever before, societal changes take place on the level of discourse – at the terrain of signs and symbols, story and spectacle. Visionary artist activists have the potential to broaden the Jewish social justice and environmental movement’s base of appeal and the reach of their message by employing culture and artistic expression alongside more traditional organizing practices. Artists and creatives are at the forefront of communicating change. The symposium intends to provide a Jewish context for their work, and help break the isolation that so often divides artists from the rest of the community. Sessions will provide artists, activists, and community organizers with practical tools as well as context. The practice of socially engaged art has much in common with community organizing. Indeed, relationship building is at the crux of most projects’ success. How is it productively done? The Socially Engaged Artist Residency is designed to serve artists working in leadership roles and in partnership with communities, in ways that are relevant in everyday life, at ambitious scale, to enact change. Art Kibbutz, Jewish artist colony, whose core mission is to protect artists from external demands (so that they can accomplish their work and connect Jewishly) also is at the same time a full participant in the local NYC and the broader, international Jewish community.